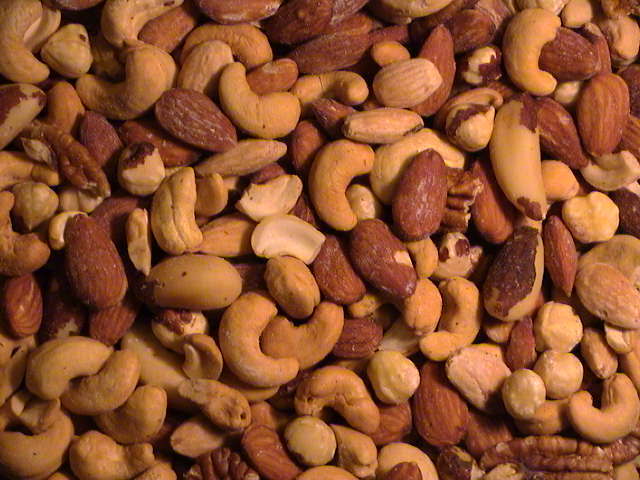 I would be much happier if they replaced the peanuts with any other nut in the mix – pecans, almonds, hazelnuts, or best of all, the most underrated of all nuts, the brazil nut. As far as I can tell (based on the prices of one-pound bags of raw nuts on this website), any of these except hazelnuts would be as cheap or cheaper than cashews. Are my preferences really that unusual? Surely some enterprising nut company could profit by producing nut mixes with a better and, apparently, cheaper distribution of nuts. But what I’d really like to have is just brazil nuts. Unfortunately, it’s very difficult to find shelled, roasted, salted brazil nuts in stores or even online. 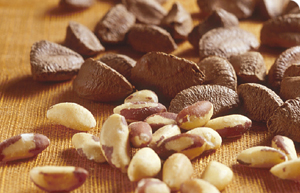 Sold alone, brazil nuts are almost always raw. This deplorable situation has, however, produced an unexpected benefit: it has induced me to try my hand at roasting my own nuts. [Insert Beavis-like laughter here.] I followed the directions here, using brazil nuts and olive oil, and I’ve been very pleased with the results. I’ve done it a couple of times now, and while I haven’t yet gotten the timing just right (the first batch was a little overdone, the second just a tad under), the roasted brazils are still mighty tasty, and the effort involved is probably less than that of sifting through a pile of lousy cashews in search of the few nuts worth eating. In other wrods, more than 4 brazil nuts a day could lead to selenosis. But I suspect that the real reason brazil nuts aren't included in mixed nut packages is that they don't keep as well as other nuts. Interesting -- I didn't know about selenosis. I've gone through periods of eating a lot more than 4 brazils per day, but fortunately have not noticed any symptoms. While there are not many brazils in packages of mixed nuts, they are certainly included, so I doubt that spoilage is the issue. i'm surprised you need to add extra oil to roast, especially to brazil nuts (which, btw, i love so very much). i roast a lot of nuts and never add extra oil, even to almonds, which don't have as much as cashews or brazils. I don't know if I really needed the oil; I used it because the online recipe said to. But it seems to give the roasted nuts a tad more flavor, and it helps the salt stick to them. Well Glen, this summer I'll tell you what we do: you bring a big container of Deluxe mixed nuts and I'll bring one. I'll trade you all of my Brazil nuts for all of your cashews. Not only will the two of us be happier, it will be an excellent demonstration for the seminar of the gains from voluntary exchange. "Unfortunately, it’s very difficult to find shelled, roasted, salted brazil nuts in stores or even online." A Google search for "roasted brazil nuts" (no quotes) turns up at least two different retailers in the first half of the first page. Cashews aren't the best nut? Heresy! My dogs will eat just about any kind of nut, raw or roasted.Walnuts are used in Chinese medicine for kidney ailments, I believe. I knew a guy with MS who ate them everyday, claiming some supposed health benefit. There are many varieties of peanuts; they're not all alike. I like peanut butter and jelly sanwiches. I like apricot and blackberry jelly the best, and I use wheat bread. Yummy! I buy fresh nuts from http://www.sunnylandfarms.com. Somewhere in all the material they send to first time customers they recommend keeping bulk nuts frozen. It really does stretch the shelf life. I like peanuts first, and cashews second. There are a few others I'm willing to include in my mixes. I buy individual packages and mix them to my own proportions.